GLAMOROUS Joan Collins' received her OBE from the Queen yesterday and told how the honour made her proud to be British. "I've lived in America for a long time and my friends ask me why I haven't become an American citizen. "It's because I love everything that goes with being British and this is one of the things that makes me so proud." Former Dynasty actress Joan, 60, looked every inch the star in a lilac David Emanuel outfit and' wide brimmed hat. She had jetted in from Los Angeles for the day. 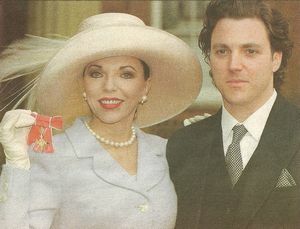 Dynasty: Joan and son Sacha Newley show off her OBE at Buckingham Palace yesterday.